The Cakes' night | Cosa Mi Metto??? The other night some friends of us went at home for a particular dinner: we ate only cakes!!!! Every girl cooked something.. guess witch cake was cooked by me!!! L'altra sera alcuni nostri amici sono venuti da noi per una cena particolare: abbiamo mangiato solo dolci!!!! Ogni ragazza ha preparato qualcosa.. indovinate quale dolce avevo preparato io!!! profiterol we have and in greece and i really love it !! i want come to u for that perfect dinner! Beautiful! Thanks for your lovely comment. 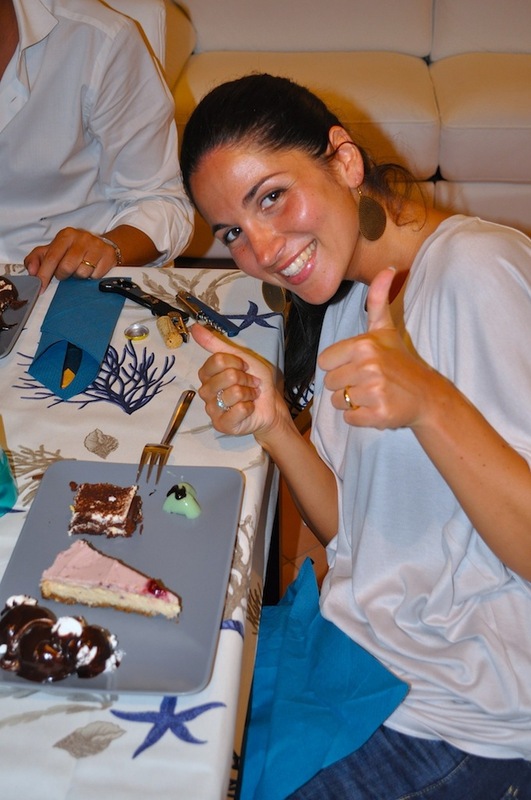 Great idea, a dinner only with cake mmmmmm! Mint pudding and chocolate sounds delicious although I've never heard of it before! Tkank you for visit on my blog:) You have so amazing hair! Fabrizia, You are as bright as the moon shining in the sky behind you. You are a beautiful bright spark. What a lovely Italian party with everyone speaking chic Italian and eating chic Italian sweets. How romantic and wonderful. Thank you for sharing. I feel like I was there and I had a fabulous time. Thank you for inviting me. Your dress is too cute, by the way!! Thank you for ur lovely comment on my blog! I love ur hair, it's gorgeous!!! cakes and beauty, what more could one ask for. you look beautiful! thanks you ! your blog is so cute ! I follow you ! I'm glad you liked my look. beautiful foto and a delicious cake for sure ! Che bella l'idea della cena a base di soli dolci... mi hai dato lo spunto per una sera di quest'estate! mi piace anche come hai apparecchiato la tavola..ma io sono di parte perchè adoro il blu!!! Mmmm...Suddenly I'm so starving! LOL! you look beautiful! very nice table decoration and nice home!! You look so cute! And those cakes look delish! thank you for the invitation. everything looks so delicious! You looks great, and you're beautiful. We'll follow you, and if you like, follow us! LOve your outfit ! Very inspiring ! Love it ! And if you like, follow me! Mi piacciono molto i look semplici ma chic come questo! Lovely outfit! I really like your dress! And all those cakes look deliicious! I like how casual this look is! Very pretty. Thank you for your comment on my blog! mi sa che sono il commento n 100 vero? !! ma che capelli c'hai sono bellissimi! Lovely pictures! You look wonderful in grey and I love your hair! you look fantastic ;) I love your hair! you look great!! thanks for your comment! sure, i follow you ))) follow me? Amo feste con gli amici! Grazie per il tuo commento, io sono fan di vostro per molto tempo e mi segui? Your hair are so pretty ! Thanks for commenting my blog post! Your style is very elegant, this dress is so pretty! Thanks for your lovely comment♥ I'm a follower! Fabrizia , carina,i follow you da molto tempo,si. e piacere per me leggere tu blog! you look fabulous! bacci! I Thank you for your comment! You look beautiful. mmm, just cake for dinner is just fine by me! your look is so pretty and simple ~ love your hair style! You looked SO beautiful, love the simplicity of the dress. Love your house!!!! Your friends look ALL like models!!!! WOWWW!!! Yum! What a great idea for a cake dinner?! You look amazing! Thanks! You've got adorable dress! Look so cute! And your hair are awsome! Cakes looks delicious! Your hair is extremely gorgeous! I'm loving your blog and style already! Thank you very much for following my blog and for commenting. Of course I follow you! I really liked your blog is very nice. We are in contact :) buena vibra! Thank you very much for commenting my blog!! I love your hair and your dress is very nice! Of course I follow you! I really liked your blog is very nice. I also invite you to visit my blog. Grazie per essere passata da me! Hai dei capelli meravigliosi! Ti seguo volentieri! love your hair!! super cute; and your simple look is perfect for summer! In the pictures is my friend. I like take pictures and I'm this interested. Thank you very much for the comment. You have a very interesting blog. You are beautiful! I will come here. I add you to the list of watched blogs. I'm sorry for language errors! love this blog! follow u! thanks for your comment (: The cakes look delicious! Very nice. I love your hair. Can I have a piece of cake? Waouh you look so cute and I love your outfit ! Wow! Your blog is perfect! I love it! I follow you,of course! The colour of your hair is lovely. Great pics. Thanks for stopping by my blog.Oh my all those cakes look delicious. I would be happy if you want to follow me. What a cute party! great idea! Thanks for stopping by blog. Like your style, follow you now. BTW, you look so elegant in this simple gray dress. Great style! how fun is that??? i should throw this party for my friends. p.s. love your dress. it's the perfect shade of grey. Thank you for your comment in my blog Fabrizia! Grazie del dolcissimo commento!Bellissime foto e blog molto carino! Thank you for your comment hunny!! I really like your hair... amazing! I really like your blog!! Thanks for your coment!! Muchísimas gracias por visitar mi blog..y te sigo!! como no.. This dress looks beautiful with your tan! love your simple look, you are so beautiful! Love Ur hair & the dress. adoro la tua tavola...bellissima anche tu naturalmente. passa da me c'è un premio per te. I hope you enjor the dinner, love your hair!!! Your hair are amaing! And your skin too! Have you dark complexion or is it tan? Probably you don't understand anything of what I write on my blog beceause I'm not very well in English and I write only in my language :) I added google translator on my blog! yumm cake night, sounds delicious!